Welcome to Flawed yet Functional! I am an adult-onset, Type 1 Diabetic using the Autoimmune Protocol (AIP) plus healthy habits and exercise to manage my blood sugar levels. 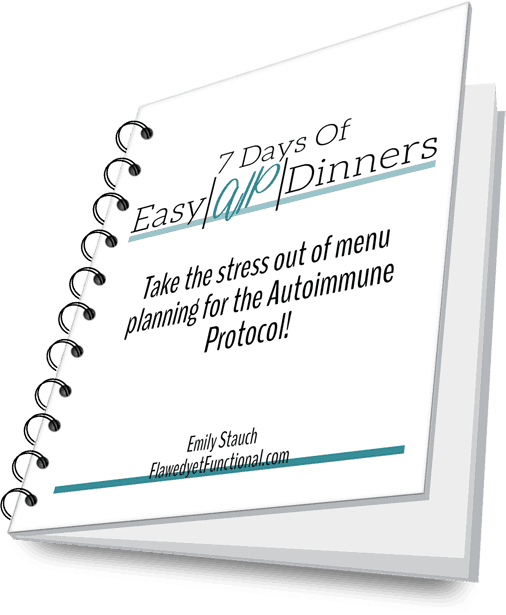 As I have worked through the elimination and now reintroduction phase of AIP, I have discovered I am sensitive to dairy, gluten, and eggs. When I say sensitive, I mean SENSITIVE. This fall has been a roller coaster of ups and downs due to silly slip ups and cross-contamination of no one’s fault but my own. Today I need to share something sort of crazy I did to try to speed up the healing process and manage my blood sugar during the healing: fasting. I am not a medical professional giving out medical advice. I am a normal, thinking human being using her brain and her kitchen to heal her body. The experiment with fasting I’m about to describe is not fit for all people, particularly Type 1 Diabetics on insulin. If you have artificial insulin in your system, you cannot fast. Your body has no control of the artificial insulin. The insulin will continue to do it’s thing (i.e. lower your blood sugar) even if you decide not to eat. Continuously lowering blood sugar without eating carbs to keep up with the insulin could kill you. So don’t do this! You must keep up with the amount of insulin in your body. I am not on insulin, and I haven’t been for 1.5 years. It’s totally crazy, I get it. But it keeps working! Since I am not injecting insulin, I can fast because my pancreas is in tune with the rest of my body. If no food or carbs are present, the body will not make insulin. Therefore, I will not go low when I fast. With that out of the way, let me tell you what I did. My blood sugar had just returned to normal following a dairy contamination when Dan’s birthday rolled around. Our family tradition is to choose your favorite dinner and cake to eat on your birthday. 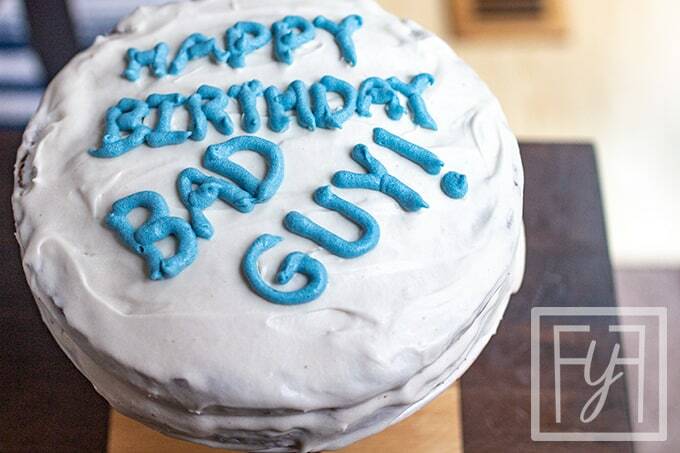 My husband’s favorite cake is carrot cake, and I happened to stumble across a gluten-free, egg-free, and dairy-free version just a few days prior to his birthday. What are the odds?! Super stoked to make him a cake both he and I can enjoy, I rushed out to buy the ingredients and spent the morning of his birthday making a beautiful, two layer carrot cake. Dan and my oldest son were going hunting that evening so we celebrated with presents and cake at 3pm in the afternoon. I had a small piece of cake knowing that it was not sugar-free even though it was all the other “-frees”. My pre-dinner blood sugar was 175 which is high, less than 130 is ideal. I was not too concerned though, because I’d had cake two hours earlier. Here’s where I went really wrong, I had another small pieced of cake with everyone else at snack time at 7pm. My pre-bed reading three hours later was 350. Oops. The beautiful gluten-free, dairy-free, and egg-free offending specimen. My kids helped me with the phrasing. Can you tell? The entire next day I was high, around 200 all day long. Furious with myself for indulging in so much cake, I did a quick google search on sugar. Wouldn’t you know? It can irritate and inflame the gut! Rats. My gut was still fragile, I’m sure, from the last dairy incident, and the sugar in the cake was just too much for my gut. The idea of fasting popped into my head. I’ve never tried a fast, but I’ve read many articles about how good it can be to reset your system. So without any planning or forethought, I decide to fast the next day and see what happens. Maintain lower blood sugar while my gut heals. I know my gut is inflamed from the sugar, and it may take 15-20 days to heal. If fasting some during that time period allows me to have lower blood sugar, that would be so much healthier for my body. Heal my gut faster. I’m curious if giving my body longer periods without food will allow it to heal faster. There’s no proof if this will actually happen. It’s just a question in my mind. Now, I was still a little nervous to cut all food out, so I did more of a liquid diet fast, if that’s a thing. I drank bone broth for my meals and tea/water in between meals. I didn’t have a plan for how long I was going to do this. My plan was just not eat for one day and see what happens. I woke up with a blood sugar of 252, and by dinner, it was normal, 104. Sweet! I was hungry so I ate a low-carb dinner at 8pm and went to bed 2 hours later with a blood sugar of 137. The next morning, my blood sugar was still elevated but not as much, 191. I fasted until lunch then ate normally the rest of the day with great blood sugar results. Feeling so proud and confident that I’d helped my gut tremendously with my faux, 1.5 day fast, I resumed normal AIP meals the next three days. My blood sugar better than pre-fasting but still not good, averaging 170-180. So I decided to do some research and make an informed plan going forward, operating under the assumption that intermittent fasting could still (1) help my blood sugar and (2) heal my gut faster. Realize this is just one big experiment, but I wanted to give it one more shot. There is a wealth of information on intermittent fasting! Most of it is weight-loss focused which is NOT one of my goals in this experiment. It seemed like a 16:8 fast (fast for 16 hours, eat for 8…basically just skip breakfast!) was sustainable long-term while still receiving the benefits of fasting. No bone broth for breakfast, only tea and water from after dinner until lunch the following day. Add 2 tablespoons of apple cider vinegar to a meal. This is to battle the current high blood sugar. I’ve done this in the past but had forgotten about it. Increase calorie consumption for lunch and dinner. Since I am NOT trying to lose weight, I need to eat two high calorie meals to ensure I maintain weight. Bring on the high calorie, low-carb foods! Isn’t that amazing?! In only 3 days, my average blood sugar dropped 30 points while still eating the same calories and carbs. I simply changed the timing of my food! Clearly my gut isn’t healed because my fasting and other blood sugar readings are above normal, but the fasting is helping to dampen the effect on my blood sugar. All while still eating enough to maintain my weight and health. Woot! I do not intend to do the 16:8 intermittent fast indefinitely, but it looks like it might be a good method to obtain lower blood sugar during a time of healing the gut. I will be sure to update this post when I believe my gut is completely healed. At this point, I am 10 days out from eating the cake, and I have blood sugar equivalent to waiting 17 days for my body to heal on it’s own (Seven days less of high blood sugar!). It makes me curious how quickly it would have worked if I had started the day after eating the cake instead of waiting 7 days! 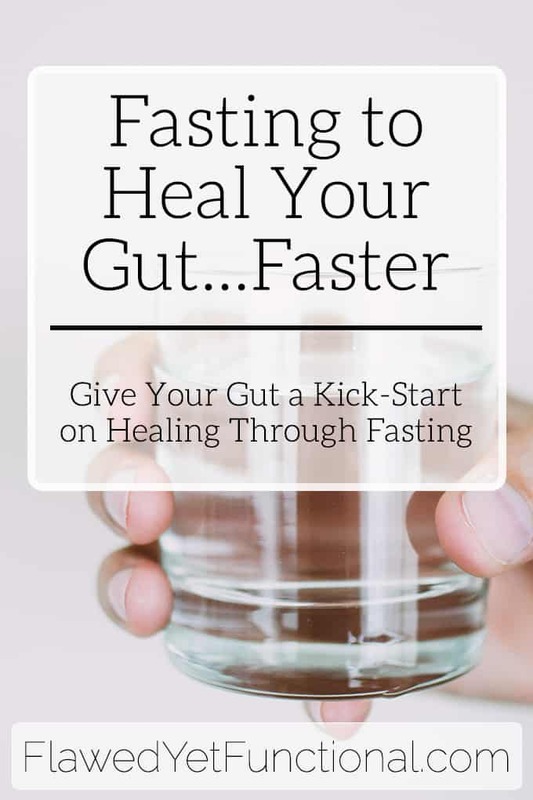 This experiment with intermittent fasting to control blood sugar and allow the gut to heal following a sugar overload has been eye opening to me. It really was just a fleeting thought in my mind, and I figured I had nothing to lose! Have you ever done a 16:8 fast? What were your goals and did you see the results you wanted?